An Esrog Tree in Rochester, NY? 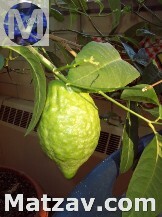 Just like our flourishing community, our little esrog tree grew and grew, spending winter inside and summer outside. Finally, five years ago, our tree found a permanent home in the front hallway of Derech HaTorah, Rochester’s Torah elementary school. It started to blossom and flower, but wouldn’t bear fruit. We turned to our favorite consultant, “Zaide Reuven,” Dr. David Wiseman of Dallas, Texas, a medical research scientist and esrog grower. He advised us that our tree needed nitrogen. Shortly thereafter, our tree once again flowered and, at long last, started to grow fruit! Imagine the excitement of coming to school each day in the spring, getting off the bus and checking on the budding fruit. Envision watering the tree and helping the principal “buzz” around the tree with a mini-brush, spreading the pollen and helping new esrogim grow. Then, picture the thrill of returning to school in the fall and seeing beautiful, full-grown esrogim hanging on the tree. Is there another school in the country (or the world) with such fortunate talmidim? Our next step was asking shailos. We checked with Rav Shmuel Feurst, dayan of Agudath Israel of Illinois, to make sure that there were no issues, since our tree is not attached to the ground. After extensive research, the rov assured us that our esrogim are completely kosher and that he himself would make a bracha on one of our esrogim. 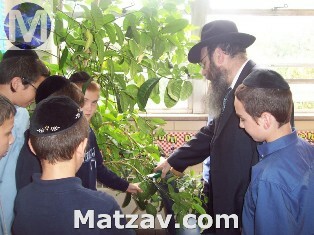 Finally, we invited the rosh yeshiva, Rav Menachem Davidowitz, to visit the school to personally inspect the esrogim. We were honored with not only a visit and inspection, but – with the whole school assembled – the rosh yeshiva gave a mini-shiur about esrogim and then, with the help of several Derech HaTorah talmidim, he cut down three beautiful esrogim. The rosh yeshiva also brought along a bais medrash bochur, Yehuda Greenberg, who also happens to be an esrog dealer in Queens. He helped evaluate, inspect and grade our esrogim. All yeshivos are struggling in today’s economy, but how many can add a budget line (in the revenue section) from esrog sales?! The esrogim are up for auction and the thrill driving the auction is not only for the zechus of purchasing a beautiful esrog and supporting Torah education, but also the idea – especially for Rochesterians – of being able to fulfill the mitzvah of Arba Minim by using an esrog grown in Rochester!